A beverage originating in Mexico that is made from vegetable juice, citrus juices and spicy seasonings. 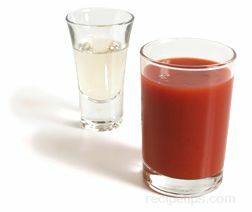 Initially, Sangrita was created as a beverage that would extinguish the intensity of home-brewed tequila. 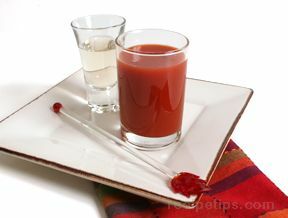 Therefore, it is common to see Sangrita being served with a shot of tequila, which is referred to as tequila completo. A typical mix of ingredients for Sangrita combines the juice of tomatoes with the juice from limes and oranges blended together. Lemon juice may be substituted for lime juice and other ingredients may also be added such as grenadine, as there are many variations of the traditional Sangrita recipe. A seasoning that is intense in heat, such as crushed chiles or a hot sauce are added to the beverage after it is blended, providing a spicy taste to the mild citrus and vegetable flavors.